Kramnik was talking to Yury Vasiliev for Sport Express, the highest-selling sports newspaper in Russia. Vladimir, judging by the average rating of the tournament – 2788 – it turns out that you’re the winner of the first category-22 super-tournament in history, for which congratulations are in order! Thank you. It’s nice to win such a tournament. As for the category… It’s clear that with four participants it’s easier to get together a very high category than when you have ten people. For example, last year’s Tal Memorial was in no way weaker, and in some ways was perhaps stronger: after all, as well as Anand, Carlsen and myself there were also Aronian and Ivanchuk. But with ten players you’re simply mathematically not going to get category 22, as the average rating is “blurred”. While in Bilbao, from a statistical point of view, it really was nominally the strongest tournament in the recent history of chess. So I’m very satisfied that I managed to win and prove to myself that I can still do a thing or two. Was it tough to play after the Olympiad in Khanty-Mansiysk? Yes, the Olympiad is an extremely tough and responsible tournament, particularly for our team, from which people expected only victories. But I already felt during the Olympic tournament in Khanty-Mansiysk that I was getting into excellent form and I asked the trainer to play me: my game was going well, my head was working clearly and I was full of energy. I came to Bilbao thoroughly warmed up and in great form. Perhaps it’s a little off topic, but I’ve got a question: you just said that during the Olympiad you felt that you were getting into fighting shape. Then why didn’t you ask the trainer to play you in the ill-fated match with Hungary? After all, it’s clear to everyone, including yourself, that whatever happened you wouldn’t have lost to Peter Leko. But Alexander Grischuk was played, he lost to Leko, and we lost the match… What can you say about that? It’s easy to talk in hindsight. Some people are now criticising the head trainer, our team captain Zhenya Bareev, but in fact the decision to play Grischuk instead of me on the first board was taken after very serious discussion. Grischuk had played well at the Olympiad, and at that moment had even won three games in a row. We consulted as a whole team and decided that Leko as white would play very tightly against me and, more likely than not, there’d be a draw, while against Grischuk he might try to play something more aggressive and thereby give him some counter-chances. But unfortunately in the game with Leko Sasha wasn’t himself. It simply wasn’t his day – he got out of bed on the wrong side. The same thing could have happened to me or to anyone else. I see. Let’s return to Bilbao. What do you think about your three mini-matches? The match with Anand was absolutely equal. As black both of us kept our opponent at arm’s length and didn’t make it possible to get any real play. The result was that there were two quite logical and natural draws. Against Shirov I won the first game quite easily as he didn’t manage to get out of the opening with a normal position, while when I played black we got an approximately equal position after the opening and the game slowly but surely ended up as a draw. The mini-match with Carlsen went very well for me. As white I won quite convincingly, and then as black I had a big advantage, but he escaped with great difficulty. In general, I managed to create something of a textbook for professionals on how you need to play in super-tournaments: pressurise as white and resist easily as black (laughs). It’s impossible to win all your games as white. I managed to win two out of three – a good showing for a tournament at this level. Did the “football” system of points (3 for a win, 1 for a draw) in place in Bilbao motivate you in some way? If the points were counted in the traditional manner I’d still have been first. Such a picture has been seen in other tournaments where they’ve used the “football” system to count points. So it depends on the organisers’ tastes. I don’t mind, if they want to use it then let them. Carlsen has recently slowed down a bit: he lost three games at the Olympiad, and two in Bilbao. He’s managed to “squander” 24 points from the fantastic rating he had at the beginning of September (and which he still officially retains). What do you think about the current form of the Norwegian phenomenon? In chess, as in any other form of sport, there are good runs and bad runs. The rating which Magnus acquired when he was on a good run didn’t, it seems to me, reflect the true state of affairs among the elite. At the given moment there are five roughly equal players – Anand, Aronian, Carlsen, Kramnik and Topalov (the surnames can be arranged in any order), who are playing stronger than the others. Yes, I agree. Vasya Ivanchuk, when he’s in good form, plays no worse than any of us. He’s a great chess player, that goes without saying. Although he’s a little less stable. The situation where Carlsen got so far ahead of the others was, in my view, unnatural, with all due respect for his enormous talent. I said the same back then when his rating was out of this world, and I’ll repeat it now: Magnus plays strongly, very strongly, but for now he’s no stronger than Anand or me. We’re playing at roughly the same level, and I’d predict that that state of affairs is going to continue for the near future. Yes, his run of successes made a big impression, to such a degree that the worldwide media stir around him almost began to make it seem as though Magnus should simply be “awarded” the title of World Champion. Perhaps those sentiments made the young man slightly relax, and this little jolt should help him to realise that it’s not quite so easy. The title won’t just fall into his hands. He needs to win it in a heavyweight fight, as besides him there are strong chess players who won’t simply give up the title to him. In terms of results, yes. I’ve got a good score against him, and I’ve also regularly beaten him in rapid chess. For now I’m a very tough opponent for him. You could even say, using the professional slang, that for now Magnus is my “client”. But I understand perfectly well that it won’t always be that way, especially as time is working in his favour. Given that we’re playing together in the Candidates Tournament, and also the fact that it’s entirely possible that we’ll meet there “on a narrow path”, it’s clear that he’ll work very seriously specifically in order to improve his play against me. Magnus is young, he’s developing, and the main thing is that he’s mentally resilient. This guy won’t lose heart after temporary setbacks. I understand that completely and I don’t have any illusions, but for now I’m his problem, rather than him being mine. The level of play you demonstrated in Bilbao was extremely high. I was particularly taken by the speed with which you took decisions in the most complicated of positions on the board. There are three classical tournaments in a row ahead of you: the Tal Memorial, which begins in a couple of weeks in Moscow, then the December “London 2010” and the January “Wijk-aan-Zee 2011”. Will you be able to maintain such impressive form over quite a long period of time? It’s true that I’m happy about the form I’ve found now. My head’s working well and I don’t feel tired. After Bilbao I didn’t feel worn out at all – I’d even be ready to sit at the board again now and start another tournament. It would be good to maintain that form in the coming tournaments, but sporting form is an elusive thing. You never know when you’ll suddenly come into a rich vein of form, and when you’ll drop out of it again. You just have to work professionally to keep playing in the same way, or perhaps even better. Moreover, there’s now an additional incentive: if I can play just as well in Moscow as in Bilbao then there’s a chance of occupying first place in the January rating list. Your live rating after Bilbao is 2791. Anand, who’s in first place, has 2803. Not a great gap. “Plus two” games won in addition to the “expected” result based on the ELO formula? Yes, something like that. But then my competitors will also be playing and will also be trying to improve their ratings. 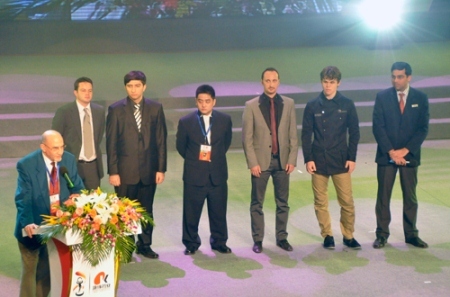 The super-tournament in Nanjing starts on the 20 October, with Anand, Carlsen and Topalov all playing. We’re right next to each other in the live ratings and the situation might change in the most unexpected of manners. But I’m not going to concern myself about the others. I have to play well myself and then I’ll have a chance of topping the rating list again. In any case the tournament in Moscow stands out for me, as you always want to play particularly well at home. I don’t know if I’ll manage to maintain the brilliant form I had in Bilbao. I can’t give any assurances, but I’m a professional and I’ve got great experience of knowing how to try and do that. I can only say one thing: I have a particular attitude when I play in Russia. Before the Olympiad in our interview for Sport Express you told me that you were planning on having your wife Maria and your daughter Dasha come to visit you in Bilbao. Did you manage to carry out that plan? I managed to drop by my house and see my family for a day after the Olympiad. Are you now planning on your daughter Dasha’s first trip to Russia being during the Tal Memorial? The tournament’s too tough, so I’ll travel alone. My daughter’s still not two and I continue to suffer from a lack of sleep. I’ll refrain for now, but at a less significant tournament, very likely at the one in Nice in spring, I’ll probably bring Daria out into the world. 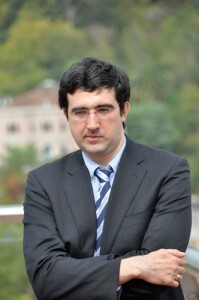 Kramnik: For now Magnus is my "client"
enjoyed this one a great deal, like all the other Kramnik interviews. Please keep these coming, you’re doing a great thing for us chess fans. Thanks! Thank you again for the wonderful article ! Thank you for making it possible for us to read this interview. I can’t quite understand what Kramnik means by calling Carlsen his ‘client’. Is he taking over from Kasparov as Magnus’ coach? Unlikely, as they are competing. Does he mean something like a sparring partner? I loved this interview. 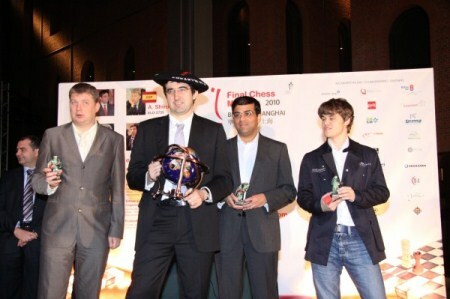 It’s nice to hear that Kramnik is feeling so good about himself. Hopefully, he’ll be able to maintain his form and get his world title back!! !